Is it about technology or attitude? Think of a company you really love as a customer. Think about what makes you love it. Chances are that it is not because they have such perfect product and processes that ensure a consistent experience every time. You love a company because they interact with you outside the cold vendor-customer relationship. Because they communicate warmly and honestly. Because they give you personal attention and fix things when the product or the process fails. They engage with you. Social CRM are strategies and technologies that put the customer in the center of the company strategy and allows for true engagement to happen. I once worked for a small technology company providing solutions for enterprise data centers. Every single customer was very important to us. We were far from perfect, but when things broke – and they did often, our attitude was to do whatever it took to fix it. They loved us. More than 15 years later, I still personally know several of the customers from that time, because lasting relationships are forged with engagement, trust, crisis and positive responses. I have also worked for larger organizations. It was all about maximizing “business model leverage”. We distanced ourselves from the end customer and “outsourced” engagement to resellers, distributors, system integrators. We engaged “with the market”, not with our customers. We tried making the average customer averagely satisfied. I don’t say that in a negative way. It is a very efficient and successful model that works if you have a large enough footprint and that has driven business since the industrial revolution. Can we do Social CRM without Social Technologies? Can you do “Social CRM” without Social Media/Networks? In other words, is Social CRM about the right attitude or is it about technology? Small independent coffee shops where you are greeted by name every morning already have a Social CRM strategy. They have no technology, no presence in Twitter or Facebook, and they truly engage and make the customer feel in the center of their business. So, that example seem to answer Bill’s question. It is about attitude and engagement. In my experience (discussed above), there is a clear a trade-off between engagement and scale. McDonald’s can offer geographical coverage and consistency, but not the same type of personal engagement that the corner coffee shop can. Traditional media and communication methods are intrinsically not scalable in corporate engagement with customers. The print and broadcasting media (press, magazines, static web content, radio, TV) are good for pushing ideas, not for bi-directional engagement. Phone conversations, face-to-face interactions, golfing outings are good for engagement, but they don’t scale cost-effectively when you have a large number of customers and want to offer a consistent user experience. Social media and social networks promise to eliminate or minimize that trade-off. The digital medium allows for multi-peer, real-time interaction that can facilitate enough engagement to produce a satisfying customer experience when things are working and specially when things don’t. As a concrete example, consumer social media sites host communities where customers can congregate to interact. If companies can make their knowledge base open to those venues, customers can self-help and peer-help when they face technical problems. If customer service representatives are part of the community, they can help manage the interaction and help many customers with common problems at once. Because company resources are not consumed resolving trivial issues (where is the user manual? Can you reset my password?) or repeating the resolution of the same problem with every single customer over the phone, resources can be redirected to those cases where customers experience problems that truly require personal attention. Internally, collaboration in most companies today is driven primarily through documents (papers and slide presentations), tools designed for point-to-point half-duplex communication (memos, e-mail) and face-to-face interactions (meetings and conference calls). Social tools (e.g. wikis, discussion forums, microblogging platforms, social networks, chat rooms, etc) can help to scale interaction and engagement and allow a large number of people to collaborate towards common goals without the excessive functional segmentation of the classical company. So, in conclusion, implementing Social CRM strategies is primarily a question of attitude. But for that attitude to scale, one need to consider the use of social media, social networks and social tools. Social Business is about making large business feel like that independent corner coffee shop again. 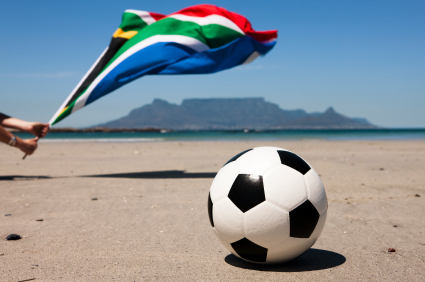 Starting today and for the next four weeks, people from the townships of Soweto to the beach villages in Brazil to the industrial towns in Northern England to the train stations in Tokyo will be brought together for several hours at a time watching the games of the FIFA World Cup, unaware of their differences and united in the appreciation of a game. “People from all walks of life that seem to have no relationship at all, held together by a common interest.” That is exactly how Dr. Michael Wu defines Social Communities in this article. Still according to Dr. Wu, in a Social Network, on the other hand, “people are held together by pre-established interpersonal relationships, such as kinship, friendship, classmates, colleagues, business partners, etc”. In real-life social environments, people move from one community to another as their interests change over time. They belong to multiple communities at the same time as every human being is multi-dimensional and has multiple interests to share with different groups. Social communities can also be Transient because world cups come only once every 4 years and because people come together and organize themselves to respond to specific one-time events (such as the ongoing oil spill on the Gulf Coast). When we talk about Social Business, it makes sense to map and relate current corporate organizations into social organizations. In corporate structures, Functional Departments are like Corporate Networks of employees held together by pre-established common set of skills and domain knowledge, organized in a relatively fixed and unequivocal hierarchical management structure. When people from different functional areas are brought together into a Project (say, design, develop, market and sell a specific product), they form something like a Corporate Community collaborating towards a common interest and pursuing a common goal. In a Classical Company we organize primarily along Corporate Networks of professionals grouped by domain knowledge. By using classical planning strategies of decomposition of the mission into objectives aligned to the organizational lines, we hope to maximize efficiency by leveraging specialization and minimizing the need for inter-area collaboration to get the job done. But, as competitive pressures increase, innovation accelerates, and information spreads faster, companies are required to respond in real-time, the classical strategic planning process modeled after functional or managerial networks falls apart and communities become the most effective model of primary corporate organization. Social Business seeks to make the classical corporate structures more flexible and fluid so that they can better leverage collaboration. To embrace Social Business, corporations will have to adapt their structure (less hierarchical, fluid organization charts), attitude (let information flow, empower and react in real-time), and process (more reliance on collaboration, less on linear workflows). Embracing it is prioritizing Communities over Networks. It is a move from tactical discipline towards real-time response. Social Business is less like German and more like Brazilian soccer. In 1998, the popular consensus was that the Internet was creating a “New Economy” and changing the world quickly. In 2001, many of the dotcom startups were falling into bankruptcy. Fast-forward to today and online commerce is an important and growing portion of our economy. About the same time Webvan was promising to deliver fresh eggs to our doorsteps, Virtualization technology emerged and promised to revolutionize computing. In December of 2003 EMC acquired virtualization innovator vmware and 2004 was declared “The Year of Virtualization”. So were 2005 and 2006 and 2007, until people stopped paying attention to the magazine covers. The technology eventually and quietly changed information technology deployments and enabled the current “Cloud Computing” frenzy. Bill Gates or anyone who has been in strategic business or technology long enough has had the opportunity to understand that ideas can change faster than business execution can, but that doesn’t mean revolutionary ideas don’t get eventually implemented. 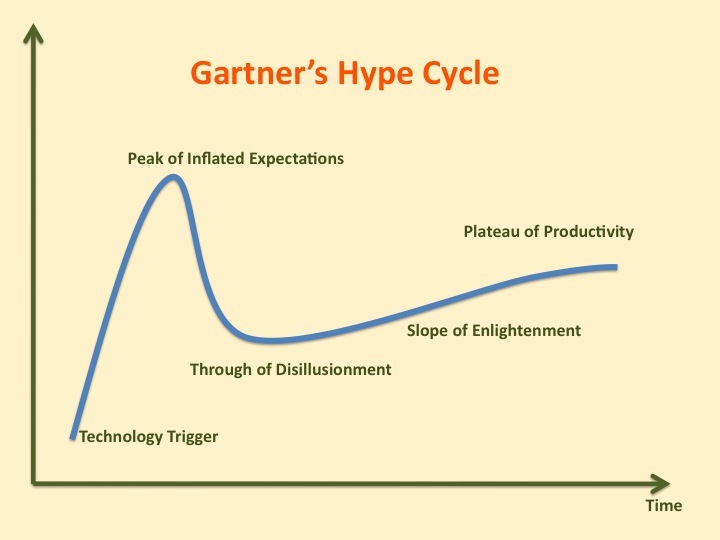 Gartner, a research and analysis firm has modeled that market dynamics using the concept of Hype Cycle. Some transformational technologies go through the hype cycle in a couple of years; others take a decade before reaching the “Plateau of Productivity.” Some never make past the ”Through of Disillusionment” phase. With that in mind, let’s look at Social Business. Social Media promises to revolutionize how Marketers communicate with the market. Social Customer Relationship Management (sCRM) promises to change how companies interact with customers and how Sales professionals operate. Social tools promise to transform organizations by changing how people collaborate. Where are we in the Social Business hype cycle? How long before it really delivers on its promises? The Cluetrain Manifesto was out more than 10 years ago and the first “Web 2.0 Conference” happened in 2004, so this is not a new movement. The technologies that triggered it are already mature. Judging by the number of consultants that are self-proclaimed “Social Media gurus” and the disproportionate attention the media (traditional or otherwise) gives to every move by Twitter or FaceBook in 2010, we are probably just past the peak of inflated expectations. Business changes associated with Social Technologies are slow and gradual because they mirror behavioral changes that are generational to a large degree (see The Click Company – Adapt or Die, about our claim that changes are result of the transition from a society influenced by the Print Medium to one influenced by the Digital Medium). That explains why it has taken so long from the beginnings to general awareness and market hype. But that generational change is in progress as people born in the 80’s are now active consumers and taking decision-making positions in business. Fundamentals of marketing and sales don’t go away because of a new media. The transition from traditional media (print, e-mail, broadcast, etc) to social media will happen over the next several years. Social CRM does not invalidate traditional Customer Relationship Management strategies, but it is a profound transformation. CRM processes and tools will evolve. Some established tool vendors will adapt, others will miss the transition and die. New emerging vendors will bring innovation and carve a space. If your current thinking is “Social Business is a fad”, review your position. We are living a shift from a society influenced primarily by linearity of the print medium to a world that embraces the fragmentation of the digital medium. Change is slow, but it is happening. If you think the world is going to be different tomorrow and there is a need to change everything, now, realize that we overestimate the changes in the short-term. Don’t be the next Webvan. The time to embrace change, invest in research, and find the right partners for the journey ahead is now. The time to execute your strategies extends for the next several years. Don’t slow down as inflated expectations subside. The 30-second video “Evolve” incorporates and illustrates the ideas above. Call you children and watch it now. 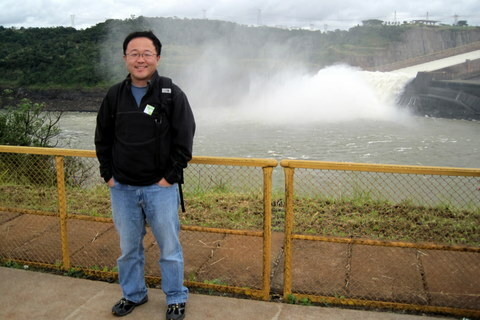 I was born in Brazil but had not visited Cataratas do Iguaçú (a.k.a Iguassu Falls, Iguazu Falls) until this past weekend. Here are some photos and some information that might be useful if you plan to make the trip there. 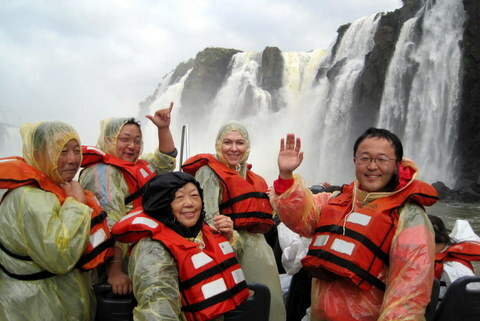 To visit the falls, your gateway city is Foz do Iguaçú (on the Brazilian side) or Puerto Iguazu (on the Argentinian side). A visit to the area is a 2-3 day affair. You can get to Foz do Iguaçú through São Paulo (1.5h flight). The Iguaçú (big water in the native Tupi Guarani language) River runs through the southern state of Paraná and forms the falls. It then joins the larger Paraná River (which feeds the Itaipú hydroelectric plant) to form the natural borders between Brazil, Argentina and Paraguay. The Falls were declared by UNESCO a World Heritage Site in 1984 and is short-listed as a candidate to be one of the New7Wonders of Nature (you can help to elect it by voting at http://www.new7wonders.com). They are within National Parks on both the Brazilian and Argentinian sides. 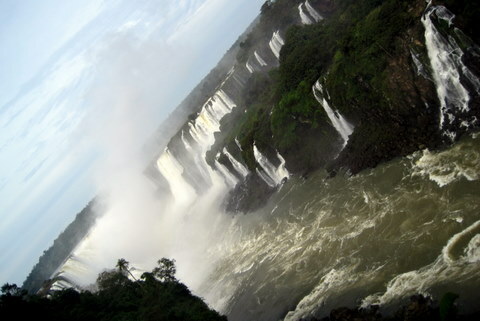 Most of the falls are on the Argentinian side, so you get the best panoramic views of the majestic falls from Brazil. Bring a light raincoat or buy a plastic one at the entrance. You will get wet. The admission to the Brazilian side is R$22 (about US$12 as of Jun/2010) and the walk along the main trail 0.8 miles can be done in a bit more than 1 hour and the entire visit won’t take more than three hours. You can take a van from the hotel, get to the park on a taxi or drive yourself. There are optional tours (bird park, jeep safari), but I have not done them. Visiting the Argentinian side is an all-day endeavor, with a good amount of walking (some 5 miles total – my 76-year-old father and 70-year-old mother were able to do it fine). While the panoramic views are less magnificent than from the Brazilian side, you can get a closer experience of the waterfalls. It doesn’t matter how you get to the entrance of the park (tour van, taxi or your own), private cars stay at the entrance. The entrance fee is 45 pesos (about US$12 as of Jun/2010). Beat the tour buses by arriving a bit before 9AM. Plan to stay until about 5:30PM (or break the visit in two days). From the park entrance, you can take a small train to the Cataratas and then to the Garganta del Diablo (Devil’s Throat) station. A 1km walk (round-trip) on catwalk takes you to the top of the Devil’s Throat fall for an amazing experience. This takes about 1.5 hours. From the Cataratas station, you get access to the “Upper Circuit” (about 1 hour), with the most panoramic views, and the “Lower Circuit” (about 1.5 hours) with close-to-the-water experiences. I recommend taking the “Nautical Adventure” (a power boat that takes you very close – or under – the falls), boarding from the lower circuit. There are additional optional tours (jeep safari, other boat tours). 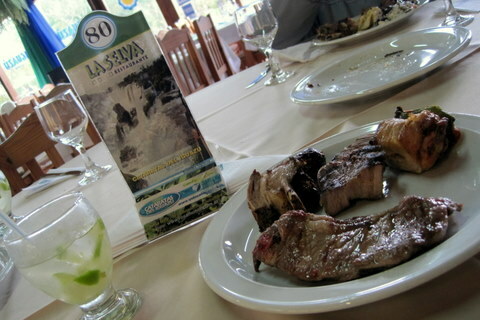 I would not expect a restaurant inside a park to be an attraction, but I really enjoyed the lunch break at the La Selva Restaurant, which offers an authentic Argentinian Parrilla experience (all you can eat beef on the grill) and an incredible value (45 pesos/person). Argentinian Parrilla at the La Selva restaurant. 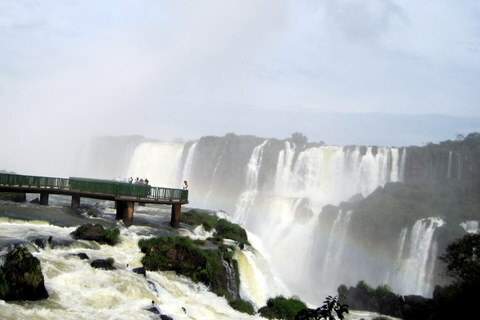 After visiting both sides of the Falls, optional tours from Foz do Iguaçú include shopping in Paraguay (very popular among Brazilians, but really not recommended for American visitors) and a tour of the Itaipu Hydroelectric plan (a gigantic facility, the world largest in energy production and the second in size to the Three Gorges). 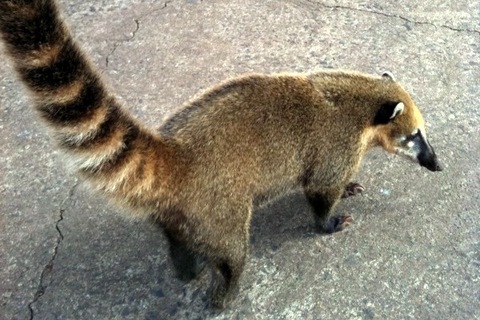 If you plan to visit Foz do Iguaçú, feel free to contact me for additional pointers. If you are in Brazil, you can save some money by self-guiding and using cabs. If you are visiting from elsewhere and is not familiar with Brazil or with the language, I recommend using a local travel agency to provide the airport/hotel transfers and local tours. We did use an agency and were very happy with it. Free Travel Brazil is a small family-run agency. They work with all Foz do Iguaçú Hotels and cover the Brazilian, Argentinian and Paraguayan vicinities. They balance the flexibility and friendliness of a small operation with the resources to organize groups and serve very specific needs.